The brutally cold surf temp has climbed in the last couple of weeks but is still lingering in the mid to upper 50s. Pray for warming. 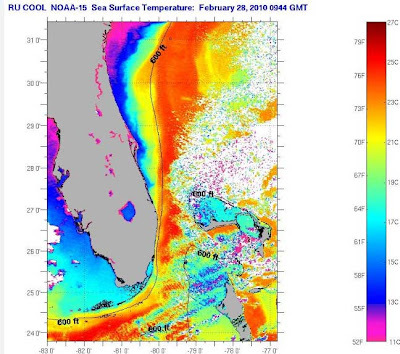 Sea surface temp chart courtesy of Rutgers University Coastal Ocean Observation Lab. The short sale process appears to be devolving. For one set of very patient buyers, seven months after writing the initial contract we finally made it to the closing table last week. And, this was with an experienced and skilled negotiator on the listing side. Even paragons of patience have their limits and another buyer withdrew a short sale offer this week after almost two years into the short sale quagmire. It's an interesting story. I presented an offer for these prospective buyers on a short sale oceanfront condo in April of 2008. The listing agent worked with the lender, Countrywide, for eight months with no success and withdrew the listing. (We continued to look for other properties during this time.) Countrywide filed foreclosure notice on the condo in October 2008. The listing reappeared with another broker in February 2009 and I presented an offer from the same buyers in March. This time a law firm was handling the negotiations with the lender, so, we were hopeful for a better result. It was not to be and the buyers withdrew their offer this week, twenty two months after the initial offer. Meanwhile the past due assessments (over $20,000) and tax bill are mounting while the Countrywide short sale negotiators are, figuratively, rearranging the deck chairs on the Titanic. Another short sale fell apart this week when the bank returned a "must-have" net higher than their year-ago number. This particular property was first listed in the MLS as a short sale in January 2009 for $119,000. After no showings for two months the price was dropped to $99,000 and an offer of $99,000 was received and submitted to the bank. Two and a half months later the bank returned with a price of $124,000. That buyer went away and the MLS price was raised to the approved price, $124,000. Five months later a bank representative called the listing office to ask what needed to be done to move the property. The listing broker suggested a price drop to put it back in line with the comps. Price was dropped to $99,000 but it received no action and, with the bank rep's blessing, the price was dropped again to $89,000. A full asking price offer was received and submitted with expectations of fast approval. Response was faster this time with the geniuses at Wachovia responding four weeks later with a must-have net of $117,000 which would mean a selling price of over $130,000 to pay off the back taxes and condo assessments. Both of these cases will eventually be foreclosures. The accumulated past due condo fees in foreclosures will be limited to six months, hurting the associations and the neighbors and the banks will wind up accepting less than they were offered earlier for properties likely needing expensive repairs after sitting neglected for years. These three short sale experiences are not atypical and do reflect what a buyer or a seller in a short sale may encounter. All three of these sales had experienced negotiators on the sellers' side. Many short sales do close but a larger number (based on anecdotal evidence on the ground) never make it to the closing table, often for sheer incompetence on the lenders' part. I'm not encouraged that the short sale process will improve considering that the lenders have already had three years of heavy short sale volume to get their acts together and to figure out a process for mitigating their losses. Fail. As I've encouraged in the past, if you choose to offer on a short sale, continue your search in the meantime. If the listing agent for a short sale doesn't have experience in the process, don't waste your time. Even with experienced negotiators, be prepared for a wait and frustration. Inefficiency reigns. If there was nothing there all along. Short sale Magnolia Bay 3/3 for $300,000. Sold new in 2007 for $589,900. Never lived-in Garden Bay 3/3 closed for $285,000. Was offered in 2007 for $550,000. Short Sale Beach Club condo conversion in Cape Canaveral, a tiny 1/1 that sold newly remodeled in 2005 for $94,000. Closed this time as a short sale for $22,500. Remodeled 2nd floor SE corner 3/2 Coral Sands in south Cocoa Beach sold for $345,000. 6th floor direct ocean Waters Edge 2/2 in south Cocoa Beach closed for $270,000. Prices notched up slightly at Portside Villas with a 2/2 short sale closing for $88,000. This unit sold new in 2006 for $234,900. And for some unknown reason, Rock Pointe on the river in Cocoa Beach was on fire with 4 closed sales so far in February at prices from $175,000 for a lakefront 2/2 to $300,000 for a big, direct Banana River 3/2 end unit. The MLS is showing 113 condos as under contract with contingencies this morning with 71 of those short sales. New listings have been slower than is normal for this time of year, so, our inventory is still shrinking as sales continue to exceed new listings. The recent prolonged cold snap appears to be over with temps back into the 70s and the snowbirds here in force and exerting their influence. Tee times are mandatory if one hopes to play a round at the Cocoa Beach Country Club and getting to the free coffee at the Publix grocery store is an even more difficult task, one I would not recommend for the weak or faint-hearted. Reports of scattered cobia south of here are starting to filter in, so, if you'd like to catch one of these very tasty fish, be ready for some of the most enjoyable fishing of the year as the water temps push up towards 70 degrees. Keep your eyes peeled for right whales which were also being spotted off our beaches last week. Feel free to email me if you have questions or comments about Cocoa Beach or real estate. That would be 45 degrees in a 35 MPH zone which describes my drive to the office this morning. Enough with this cold weather already. I have written dozens of posts over the years about unrealistic sellers clinging to expectations of prices completely at odds with the state of the market at the time. While there are still plenty of LaLa Land dwellers offering properties at 2007 prices, there is an equal contingent of hopeful buyers with equally unrealistic expectations. No buyer should overpay for a property in these uncertain times but fantasy-based expectations may preclude a purchase from happening. A goal of besting the deal of the year could be an open-ended quest. Shooting for the best possible unit at the best possible price with goals based on recent comps and current market direction is a formula for success. There are multiple buyers looking to purchase a condo in Cocoa Beach at any given moment, regardless of price direction, obviously more when prices are moving up. We began the current downtrend from the peak in prices in 2006 with well over 1000 condos available on the MLS in Cocoa Beach and Cape Canaveral. Buyers continued to buy as prices eroded but rather than buying anything available as was the case in previous years, they became more picky, preferring the best units and at better prices. Along the way, some sellers found themselves in trouble, underwater on their mortgages or both, and either pursued a short sale or just walked away. Those distressed properties were subsequently bought at great discounts to the earlier prices. Flash forward to 2010 and our inventory has been cut in half with a large portion of the distressed properties having been sold. Buyers still looking understandably want the same deal as the last guy but for some buildings or property types there are no distressed sellers left. With the supply dwindling many of the remaining sellers have taken an educated gamble by standing firm and waiting for a buyer willing to pay the going rate of non-distressed sales. Many of the buyers have taken a similar stance and are refusing good units at good prices, gambling on another distress sale in their target unit type. We have a standoff that could go either way but, with declining inventory, is increasingly tilting away from the deal-of-the-century buyer. I suspect that the fear of paying slightly more than someone else will keep many hopeful vacation homeowners from ever purchasing. This post was prompted by two encounters with condo shoppers last week. One who announced at an open house that he was going to be buying oceanfront units for $60,000 and flipping them next year when the market rebounded. Never mind that there have been no sales at that price nor any listings close to that number. Good luck, Sir. The other couldn't understand why sellers weren't responding to his offers far below recent comps. Meanwhile 21 other condos buyers have reached acceptance on their offers since February 1 in Cocoa Beach and Cape Canaveral. The strong sales trend of the last four months is intact as we enter the busiest time of year for real estate sales in Cocoa Beach. 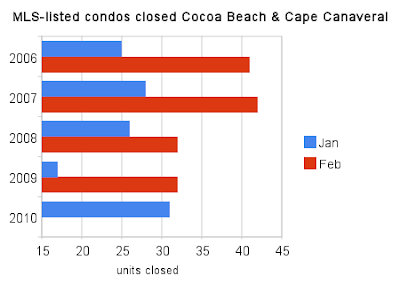 As of this morning, Realtors have recorded 31 condos and townhouses closed in Cocoa Beach and Cape Canaveral in the month of January. With that number, January 2010 was the best first month for sales since 2005. Looks good for February as you can see from the chart above. Seven of the 31 were short sales and nine were bank-owned. The short sales were in all price ranges including the two highest sales. The nine foreclosures were all in the lower price ranges with only one over $200,000. Five single family homes closed in the month. Of note were two waterfront Cocoa Beach sales. One was a small 2/2 canalfront on Cocoa Isles Blvd. in mostly original condition that sold for $220,000. The other was an open water Danube River 3/2 with some upgrades that closed for a jaw-dropping $250,000. Don't forget the last nighttime launch of a Space Shuttle this Sunday. "Deals are meant to be renegotiated."